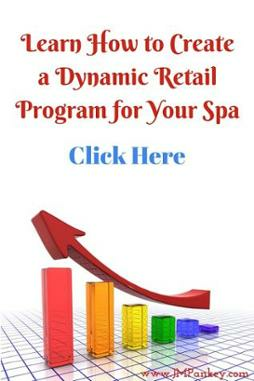 A spa retail platform is a carefully thought-out retail program for your business. It is more than just selecting spa products and putting them on your shelves. It is a mix designed to maximize revenue for your designated retail space – and as a spa owner or spa manager, you know that bringing in revenue is very important to keeping your spa in business! Access your retail space; you want to be sure that you have enough space/area to create an inviting retail business. Maximizing your Retail Space is critical to yield the profits that you seek. If you already have an established retail space, study your current brands and product mix and either phase out lines and introduce new ones. Decide what skin/body/hair/makeup/accessory and lifestyle brands you would like to have. Attend some trade shows and look for interesting lines that your spa clients would respond to. The ISPA website is another great resource. Schedule meetings with the reps and sample products with your team. Consider price point, packaging, price and quality of the brand and place in market. Go with your gut, if you love it, most likely your clients will too. Or do you find that your clients are asking for products or brands you don’t carry? When looking at brands, you want to align your products to your services. Every treatment on your menu should have a corresponding product that can be promoted. Additionally you should be using all brands as professional backbar, unless it is a lifestyle product, and even at that, at times they can be used. Do the brands complement one another? Are there multilevel price points for clients? What pricing do your clients respond to? Do the brands align with the spa business concept and overall philosophy? What are the ingredients, are they of quality? Is the packaging aesthetically pleasing? How long have the vendors been in business? What sort of training and support do they offer? What is their return, damage or expired product policy? How will the products be displayed? Align all retail products by treatment category (body, face) and sub-classification (skin type). For example, stocking 6 types of eye creme when you only need two, holding more than 1 neck creme or multiple acne lines. When you visually look at all your products by category you can see where you are too heavy or light. Pay careful attention to specialized treatment products, no more than 1 or 2 per skin type. Additionally, you want a well-rounded lifestyle category, such as wraps, totes, cards, soaps, hand cremes, jewelry. Think of your retail area like a mini boutique, you have a captive audience and if they don’t buy it from you, they will somewhere else. Once you have put pen to paper, tweak the brand(s) and then place your orders. No one can afford to carry SKU’s they don’t need. Time to merchandise. Always start with a clean slate and build from the bottom up. Pull everything off your retail shelves, clean and reset. Create a flow to your retail, with inviting colors, schematics and decor. What does the client, see, smell and hear? All the details you need to Maximize Your Retail space are here. Time to get to work! Whether you are building a new spa or updating what you have, resetting your retail platform or developing one is always a critical step to spa development and profits. Just like any department store, you need to plan, analyze, and execute. We’ve created a program to help you begin the process. Click below to download.